I sewed this top up yesterday and we took it out on a bike ride this morning to photograph. The sun was bright as you can see! I’m really happy with how this quilt came together…instead of all white background squares I made 7 blocks with a light gray background to mix it up a bit. The colors are all soft and muted except for some bright pops of orange, navy, and green. The trickiest part of this quilt is matching the seams in the end…and the seams don’t nest or lock…so I pin the seams as I sew to help them match up a bit better. The fabrics are a wide variety from my stash, and the pattern is Basket Case. I modified the pattern a bit as mentioned at the bottom of my last post. we’ve got a little (or a lot) of orange in the garden already! 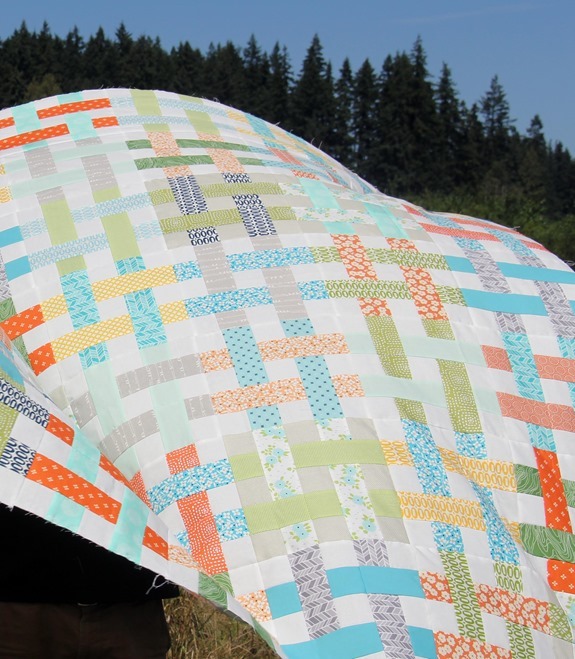 Love that quilt, especially your use of the gray blocks! Am admiring your pumpkins too. What state do you live in? Can't seem to find it mentioned on your site although I've been following you via RSS feed for quite awhile, I can't remember. Thank you for all your inspiration. 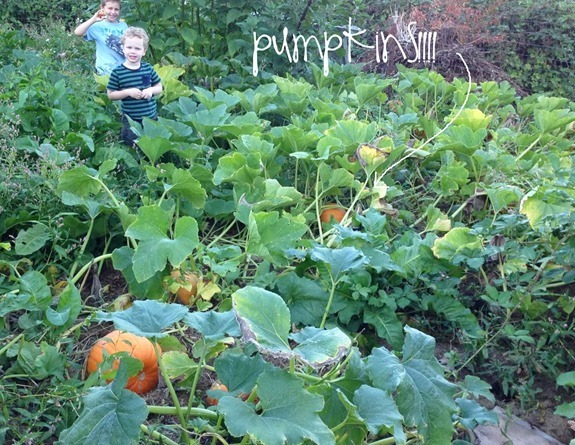 Wow – pumpkins already! There's a hint of autumn about the quilt too – lovely lovely colour, and the grey just gives it a bit of extra depth. Hi Alison! I love this quilt. I saw it in my blog pic roll and I had to click over and tell you how cute it is :)!! I love that pattern! I can't wait to buy a house so I can plant pumpkins! Love it——one of your best. So is the pattern FOR sale or ON sale?? I am not finding a post with sale information. 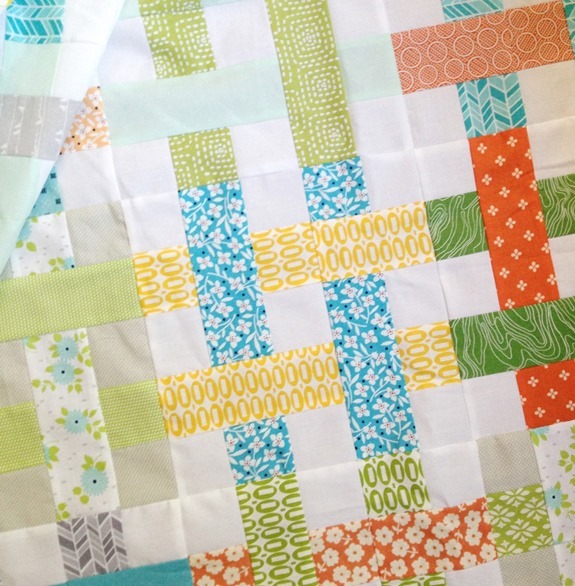 LOVE this summery breezy quilt!! So if this is the AUGUST quilt have you made a MONTHLY quilt this year and I just haven't noticed?? I'm in the southern hemisphere and we're waiting for that first glimmer of Spring in the air! I am very fortunate to own this pattern. I am waiting for your new line of fabric and will make a quilt with one of your patterns. 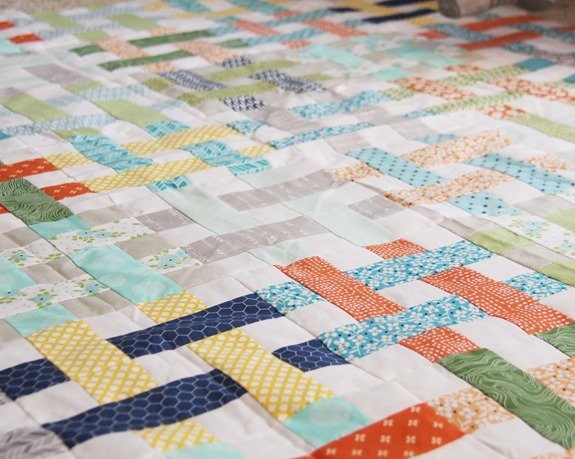 Oh Allison….this is another beautiful quilt top! Congrats on this finish. It's so lovely! The grey background mixed in with the white works so well. Wow. Absolutely beautiful! You're inspiring to read. Time to get my sewing machine fixed and give it a try. Super cute – LOVE that pop of orange, navy & green. Wish my pumpkins would do something….the blossoms just sit there! The quilt looks fantastic. Great work. Nice colors and I like the gray addition. This is my favorite of all your patterns. I love the way it shows such dimension. Love the fabrics too. 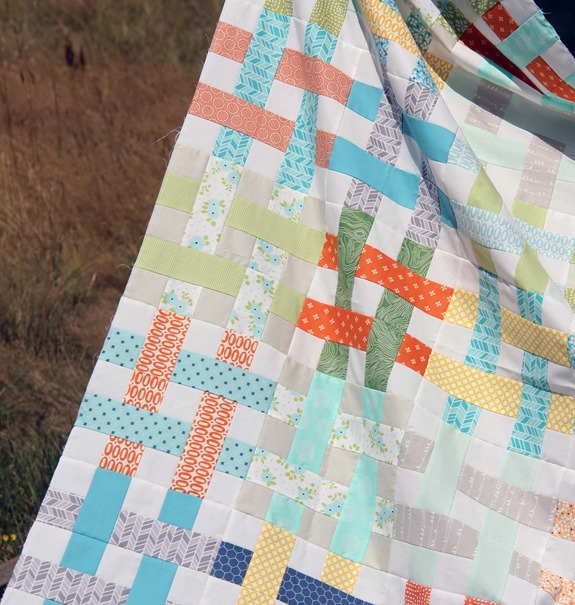 I recognize several of the fabrics you used—I bought several prints in orange and turquoise to make your "Road Trip" quilt. My plan is to make two of them—one for Margaret's Hope Chest, and one for my gift closet—I work with several young women who are trying to have babies right now, so I picture a whirl of baby showers in the near future. Your quilt is beautiful. Beautiful! I love the colors you have chosen. Did you really say you sewed this ALL in one day? This would take me months and months. HOW? Itis beautiful. But so are those pumpkins. Allison, your quilt is gorgeous, as always! Thanks for the inspiration! Very interesting how the lines look like the go under and over the others. Nice fabrics you chose too. OMG I can't find the words to tell you how very impressed I am over this creation. You did Wonderful with a capitol W. Keep it up. I love your work. This is one of your best patterns .You know a pattern is great when you want to make it again and you can envision it in many fabrics. I just made it with Happy Go Lucky for our local shop and it is adorable.Thanks for sharing. I love all of your patterns. Every.Single.One. And looking at "Scout" in my bedroom makes me happier than I can tell you!